You can click on a coupon below and print it. Then present it to us when we do your furnace and duct cleaning, or chimney cleaning. 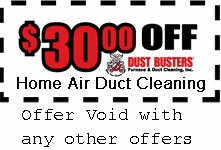 Thanks for using our duct cleaning and chimney cleaning services! A dirty furnace and ducts can be a health hazard. A clogged up chimney or a clothes dryer can cause a fire. We are professional duct cleaners and dryer cleaners. Contact us if you have questions.